Shake with ice and strain into a white wine glass. Two Sundays ago, Andrea and I ventured down to Milton to eat dinner at Steel & Rye. The bar program there is now headed by Craigie on Main and No. 9 Park alum Ted Gallagher and another of the bartenders is Green Street and Alchemist Lounge alum Derric Crothers. While it was Derric's night off, we did have the honor of getting to sit at Ted's bar again. For a light start to the evening, I asked Ted for the Maritime Out which was his addition to the Daiquiri Time Out (or D.T.O.) phenomenon in the area. Some bars, such as Brick & Mortar, have D.T.O. 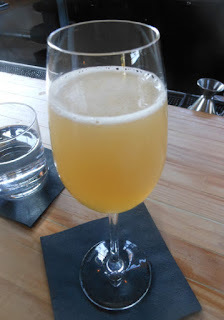 's as shooters or cocktails on the menu, and others have Daiquiri variations such as Eastern Standard's Chappaquiddick. The Steel & Rye Daiquiri variation strayed by calling for rhum agricole with much of the spirit's potency cut with Bonal Gentiane Quinquina. The Maritime Out offered a grape and grass aroma. The grape continued on into the sip along with the lime, and the swallow offered the rhum's grassiness balanced by the Bonal's bitter herbal notes and finishing clean from the lime crispness.